We wrap up our nostalgic look back at King Willem-Alexander and Queen Máxima’s wedding on February 2, 2002 with a look at the royal hats worn by guests from Spain, Greece, Jordan, Great Britain, Monaco with a few extras thrown in. Queen Sofia of Spain wore a cascading headpiece of golden beige organza leaves and roses. While the design looked transported from the 1960s, it linked well with her lace suit. Princess Cristina wore a heather purple felt brimmed hat trimmed with feathers in purple and dark grey. I’m still at odds about the feather placement- on one hand, it’s terribly messy but on the other, I like its exuberance and admire how the two shades link with her dark blue velvet and purple silk coat… a rather bulky item (it looked like a blanket) that hasn’t aged well. When a hat makes a coat look better, that can only be a good thing. Queen Anne-Marie of Greece topped her textured red coat with a matching hat. In a modified top hat shape, the felt design features a tall, flared crown with domed top, upturned rolled brim with downsweep on one side, a layered red felt hatband and brown mink pompoms. The mink trim links well with the mink trim on Anne-Marie’s coat without being overly matchy and those pompoms are whimsical and fun. This hat’s unique shape is very much of its time but I always thought it was a bold and brave choice for her. Princess Marie-Chantal followed the same formula as Grand Duchess Maria Teresa, topping her richly patterned brocade coat with a tall brown fur Cossack style hat. Unfortunately, the hat’s large scale completely overwhelmed her and I’m still trying to see how it relates to the red, magenta and gold printed coat (which it’s own, is gorgeous!). Queen Noor of Jordan wore an embroidered headscarf in white, an interesting colour choice for a winter event with her baby blue silk tailored suit. She is photographed below by the Prince of Wales who wore his naval uniform and cap. Princess Sarvath, Princess Badiya and Princess Sumaya are also listed on the guest list but I’ve not been able to locate any photographs of them. The Countess of Wessex wore primarily Philip Treacy millinery hats at the time and chose one in camel felt for this event. The design made its style statement primarily by shape, pairing a deeply pinched, tall stovepipe crown with an offset brim. The hat was minimally embellished with a slim hatband tied in a front bow. It’s another design very much of the time and looking at it now, seemed a little heavy for Sophie’s cream coat and delicately embellished dress. Prince Albert of Monaco wore military uniform with cap while his elder sister, Princess Caroline of Hanover and Monaco, wore a grey felt cloche with extended brim and wide grey hatband. The hat’s classic shape suited Caroline well although I’m not sure about its pairing with her Chanel dress and coat, pieces that feel like they ought to be paired with something more luxurious and bespoke. Princess Míriam of Bulgaria topped her pink feathered skirt and fur collared jacket in a what looks like a headpiece of horizontally placed pheasant and pink feathers, placed on the back of her head. Princess Inaara, wife of the Aga Khan at the time, wore a calot hat in large flowers with petals made of mocha and copper organza, velvet and crin (see closeup here). The mixed textures on the piece gave it some life and while it related well to Inaara’s fur trimmed camel cape, these combined less well with her mushroom grey tweed suit and earthy green blouse. Too many neutrals, I’d say. Other noteable guests included Nelson Mandela and Graça Machel, who wore a traditional African printed capulana headwrap and UN Secretary-General Kofi Annan and his wife Nane, who wore a brimmed hat in pale pink straw. This wraps up our look back at this wedding! What do you think of this final group of hats? to this day in 1969 and the christening of Prince Nikolaos of Greece and Denmark. The hats worn by his mother, Queen Anne-Marie, grandmother Queen Frederica and aunts Princess Sofía, Princess of Asturias (future Queen Sofia of Spain) and Princess Irene of Greece and Denmark are a parade of brimless millinery at the height of fashion in the late 1960s. to this day, fifty-one years ago, when a Crown Prince Pavlos was christened in Athens amidst several magnificent gowns and hats. On Monday, members of the Danish royal family gathered at Lyngby Church for the funeral of Princess Elisabeth who passed away on June 19. Queen Margrethe was joined by her two sisters, Princess Benedikte and Queen Anne-Marie, all in black hats to remember their cousin’s life. Also in attendance was Elisabeth’s brother, Count Ingolf of Rosenborg, his wife Countess Sussie (below right) and their three nieces, Countesses Feodora, Camilla and Josephineof Rosenborg, daughters of Ingolf’s late brother Count Christian of Rosenborg, all in black hats. On Tuesday, Queen Margrethe opened the royal yacht Dannebrog’s sailing season in her repeated navy felt hat with silk hatband that ties in a side bow. With her navy suit, red and white blouse and anchor brooch, the hat topped a suitably (but not to obviously) nautical ensemble. Yesterday, the Danish Queen was at Frederiksberg Castle to visit the Army Officer School headquartered there on this, its 150th anniversary year. For this event, she repeated a straw hat with ecru crown and double grey brim. This design is intriguing- something not always said about a design in such neutral colours – with the upper brim in a kettle upturn and the lower brim, under a white band, appearing to be flat. I want to see this closeup for a final verdict but it looks wonderfully promising. Today, Queen Margrethe was joined by her sisters, Princess Benedikte and Queen Anne-Marie of Greece, to celebrate the city of Kolding’s 750th anniversary. The visit, which included a stop at a new exhibition held at Kolding Castle Museum, Queen Margrethe repeated her red bumper hat with navy floral patterned bow trim. Princess Benedikte wore a new pale grey straw beret base percher decorated with a pleated grey silk ruffle. Queen Anne-Marie wore an upswept brim design in natural straw that appears to be embellished. H.M. Dronningen, H.K.H. Prinsesse Benedikte og H.M. Dronning Anne-Marie ser på "Bryllupsdiademet", som de alle tre har båret ved deres bryllupper. Diademet er sammen med andre af den kongelige families ordner, medaljer og smykker udlånt til udstillingen "Magtens Smykker" på Koldinghus. I dag deltog de tre søstre i Koldings og Koldinghus' 750-års jubilæum. Designer of Queen Anne-Marie’s hat: looks like Lock & Co. While some of these hats are ones we are very familiar with, the two new grey designs are both distinctive- one for the brim and the other for the ruffle trim- and both impress me. What do you think of this parade of hats in Denmark this week? The funeral of Prince Henrik of Denmark took place today in the chapel of Christiansborg Palace, attended only by family, close friends and the late prince’s staff. Queen Margrethe led her family in her fur black bumper hat. A long black silk veil was anchored in between the upfolded front brim and crown of the hat that framed her face and trailed down her back. Crown Princess Mary repeated her black felt calot hat designed by Susanne Juul. The feather and felt leaf spray that was added to the piece in 2015 was joined today by the further addition of a black net veil. Princess Marie wore her black felt Garbo hat with wide brim, trimmed with a pale grey hatband and cluster of black felt flowers on the side. Princess Benedikte wore her black bumper hat with diagonal stripe detail on the cuffed brim. Queen Anne-Marie repeated her black felt bumper hat wrapped in a wide swath of dotted net veil. The hat features a double upturned brim, the inner of which is made of silk. Princess Elisabeth wore a wider brimmed design in light black straw, trimmed with a large ruffled bow at the back. Countess Sussie of Rosenborg wore a prim bumper hat embellished with a gold button on the side. 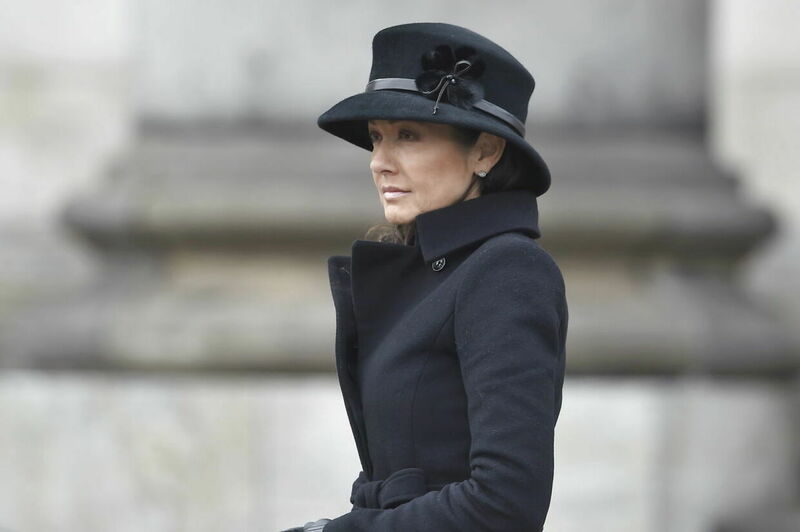 Countess Alexandra of Frederiksborg wore a black felt cloche variation with square, domed crown and short downturned brim. A slim leather hatband and black feather flower at the side trimmed the piece. The service was broadcast on Danish television available for international viewers to see here (the royal family’s arrival starts at 1:49:00). Additional photo galleries can also be seen here and here. A final note- well known for his love of flowers and gardening, Prince Henrik requested that the memorial wreaths today be arranged as a flower garden as a last surprise and gift for his wife. It was beautiful. I know you will join me in wishing peace and comfort to the entire Danish royal family as they continue to grieve this immense loss. 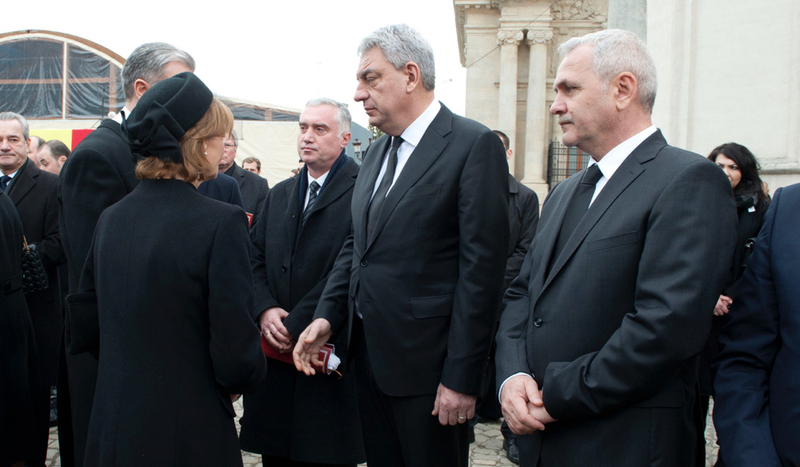 Representatives from several royal houses gathered in Bucharest on Saturday for the funeral of Romania’s last king. King Michael’s daughters, led by Crown Princess Margareta who is now styled as ‘Custodian of the Crown of Romania’, all wore conservatively styled black hats or veils. Princess Margareta’s bumper hat features a large, double bow at the back while Princess Elena’s hat has a cuffed brim in the same fur as her coat. Royal Musings reported yesterday that Nicholas Medforth-Mills and his fiance Alina-Maria Binder were quietly married in a civil service (their religious wedding remains set for next summer) recently, presumably so that the couple could attend the funeral together. 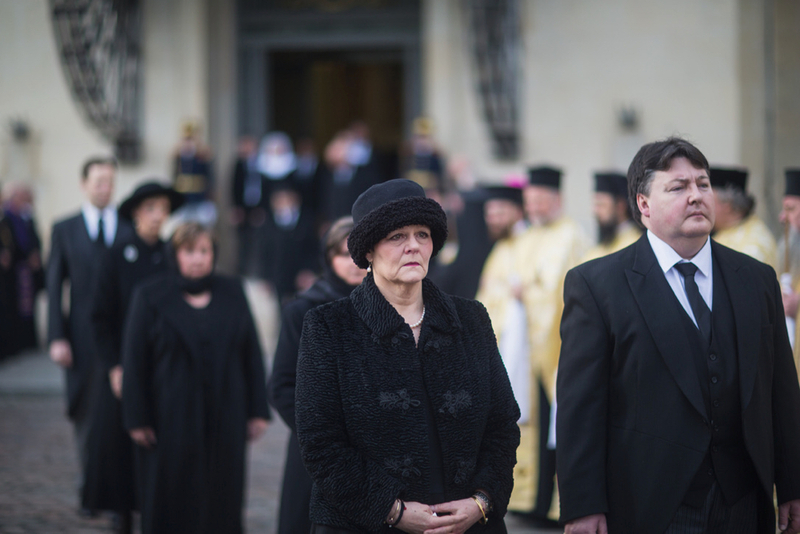 Queen Silvia wore a black felt pillbox, wrapped in a silk pseudo bumper brim and trimmed with a flat bow at the back. 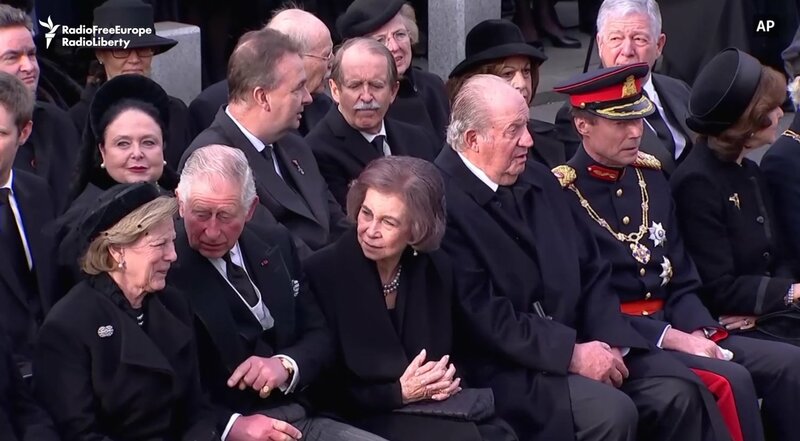 Queen Sofia of Spain wore a loosely woven net veil anchored to her hair with a small back bow. Queen Anne-Marie wore a black felt bumper hat wrapped in a wide swath of dotted net veil. The hat features a double upturned brim, the inner of which is made of silk which lends lovely sheen and contrast to the monochrome piece. It is finished with a ruffled flourish at the back. Grand Duchess Maria Vladimirovna of Russia wore a black velvet pleated headpiece in her go-to traditional Kokoshnik shape to which was attached a black veil. Crown Princess Katherine of Serbia wore a simple black hat with rounded crown and relaxed mushroom brim. Princess Astrid of Belgium wore a black faux fur pillbox trimmed with a silk rosette and leaves. Princess Muna of Jordan wore a white lace veil. Behind her, Princess Isabelle of Liechtenstein wore a large black straw hat with wide, exaggerated mushroom brim. The crown appears to be wrapped in a wide straw hatband (almost in the style of a bumper brim) overlaid in a dotted sheer organza or crin.